Providing a way for your blog readers to contact you is the most important that your blog needs to have. your blog should have a contact page that contains a contact form. So, I am sharing how to add a contact form to blogger blog in this tutorial. Having a contact form on your blog is important for various perspectives. The first thing that adds value is that your readers trust you and a thinking builds in their mind that you are there to help them. Also, if you are just starting a blog and want to monetise it then it will help you in getting Adsense approval fast. Having a contact us and about us means the blog is not a scam and the person running the blog is not a scammer. sometimes some Adnetworks or affiliate networks want to cooperate with you, so having a contact form on your blogger means they will reach to you easily. If you wish to add a contact form on your blog like we have, follow the procedure given below. I promise you will end up having a good looking and easy to use the contact form for your blog. Although there are countless ways to add a contact form to blogger page, today I am going you to tell about the easy method that works well for both Blogger and Wordpress. Since blogger doesn't have contact form gadget to add in a page. It has contact form gadget but unfortunately, you can only add it to the sidebar of your blog. On other blogging platform Wordpress, there are a lot of plugins that let you add a contact form to a blog page like Contact Form 7 or Fast Secure Contact Form. These plugins are easy to install and use however having too many plugins installed on your WordPress blog can decrease its performance. Today, in this tutorial you will get to know how to add a contact form on a blog without using any plugin or gadget. We will be using a service called Wufoo. 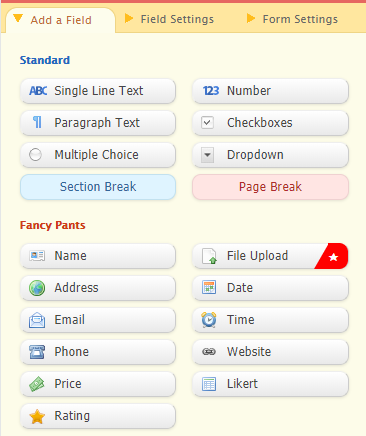 Wufoo is a free and fabulous form building service for your blog that is hell easy to use. They also provide you with tutorials to help you to enhance your form appearance and fields. Step 1: Go to Wufoo and sign up for free. Step 2: Once you create your account on Wufoo, click on create form. Step 3: Now, let us start by adding Name field in our form. Click on the name button to add it to your form. Step 4: Just after getting their name, we will require their email addresses to contact them back. So for that, we will add Email field in our form to collect their emails. Just click the Email button to add it to the form. Step 5: Now the next is to add a message box in the form to let people add their messages. For that click on the paragraph, button to implement it in your form. Step 6: You can also add additional fields like ratting, website and much more. Feel free to add them to your form. I'm not gonna discuss these here. So, let you yourself try these and find which suits your blog. 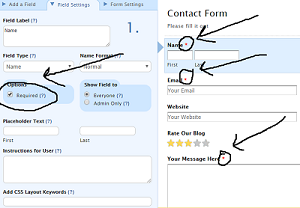 Step 7: We have added three important fields to the contact form. The next step is to make them required so that these steps can't be skipped while sending a message. 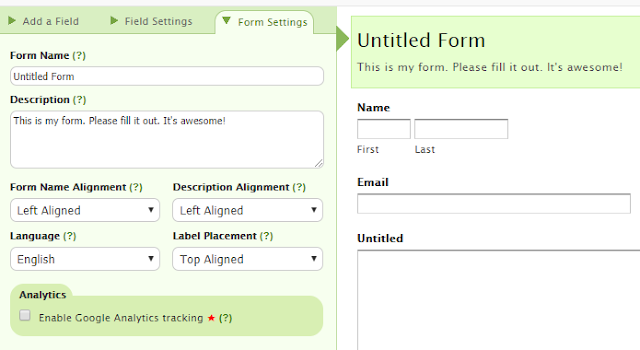 Step 8: Now give a title to your form. Click on the Untitled form field or form setting to edit the form title. Change the untitled text to the Contact form. Also, edit description by putting text like Reach us By filling up the form below or simply keep it blank. Now click on the forms tab present at the top of the Wufoo Dashboard and you will get forms you have created. 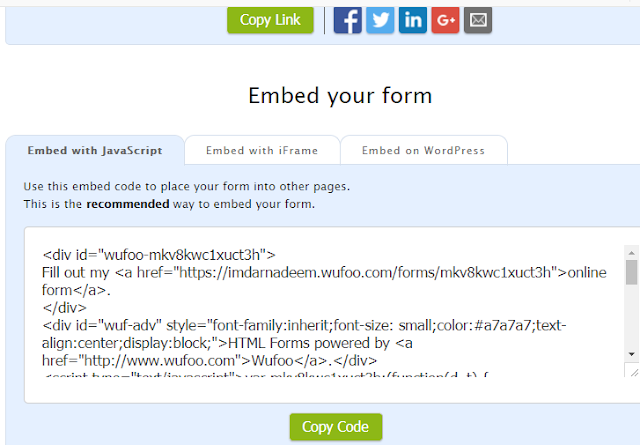 Click on the share button and then embed form. Step 10: Now go to blogger. Select the page in which you want to add the Contact form. Turn to HTML mode and paste the code. Update/Publish the page and you are all done. I hope you will have understood the whole tutorial and are able to create a good looking contact form for your blog. If you have any suggestions regarding the blog, feel free to write to us. If you have any questions or want us to add anything to the tutorial How HOW TO ADD A CONTACT FORM TO YOUR BLOGGER BLOG, please add it to the comment box below.